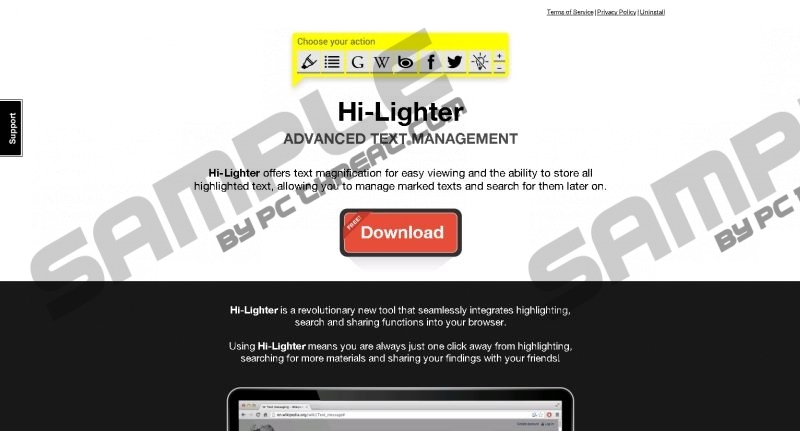 On the official website of Hi-Lighter the user is greeted with statements claiming that this application is an excellent tool for text magnification, for easy viewing and for the ability to store all highlighted text. At first it might sound like a great program to have while in reality it is just one more adware application that will not do what it should in the best way possible. Such statements are employed by the vendors of this program to lure numerous unsuspecting computer users into installing a program that holds no valuable features whatsoever. The only thing that this intrusive ad-supported program is capable of is disturbing you almost every single time you decide to browse the web. This is an annoying and frustrating experience, to say the least, and it is one of the reasons we highly advise you to delete Hi-Lighter as soon as it is found active on your PC. As soon as Hi-Lighter enters your operating system, it will implement browser extensions to major web browsers such as Mozilla Firefox, Internet Explorer, and Google Chrome. Such broad compatibility signifies that no user can feel entirely safe. The intrusive extensions are used by this adware to contact various adware servers. Once the connection between the ad-supported application and the adware server is established your browser will be filled up with an unusual amount of unwanted third-party web content. In most cases, such invasive web content is presented to you as various third-party commercial ads and annoying pop-ups. At times, your web browser could get flooded so much that you could be forced to fight through all the ads and pop-ups so that you could continue to browse in a normal way. In fact, such activity promoted by this adware will make browsing the web the way you are used to virtually impossible. Complete removal of Hi-Lighter is the only way that you can regain the standard functionality of your web browser; otherwise all the ads and pop-ups will continue to ruin your online experience. Unfortunately, there is something much more alarming about Hi-Lighter than the annoyance that it causes. Malware experts at our internal labs have discovered that at times this adware might provide you with ads that are implemented with redirect links. This is dangerous since by clicking on a simple ad provided by this adware you might end up on a suspicious third-party website. You might be taken to a fake online shop, which could have devastating outcomes to say the least. If you have encountered such online store, do not purchase anything from it before learning about it as much as possible because you might end up providing cyber crooks with your credit card data. Do not take any chances with this ad-supported program and remove it right away. Even though the removal of Hi-Lighter is rather simple since you can delete it via Control Panel, your utmost attention is still required because even a single mistake could mean that the infectious program was not removed entirely. If you wish to be sure that everything associated with Hi-Lighter has been removed from your PC we highly advise you to scan your PC with a reliable antimalware tool once the manual removal has been performed. Select Hi-Lighter and click Uninstall. Click Start an select Control Panel. Confrim that you want to remove it. Right-click Hi-Lighter and select the Uninstall option. Quick & tested solution for Hi-Lighter removal.